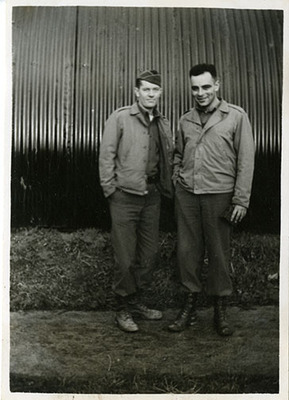 Charles W. Davis and Medieta posed outside of a Nissen hut at Camp Gortalowry, Northern Ireland. This is part of a group photographs labeled S-2 Section, which is a designation for intelligence at the brigade or battalion level. The photograph is dated between December 1943 and January 1944.